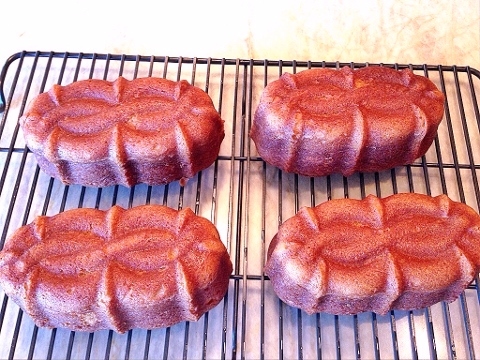 Persimmon Teacakes - Recipe! - Live. Love. Laugh. Food. Persimmons are a bright orange, delicate fruit with Japanese and Chinese origin. Persimmons come in several varieties, however – Hachiya, which are considered more astringent, than its counterpart, Fuyu – slightly sweeter, more squat like a tomato and are readily available. 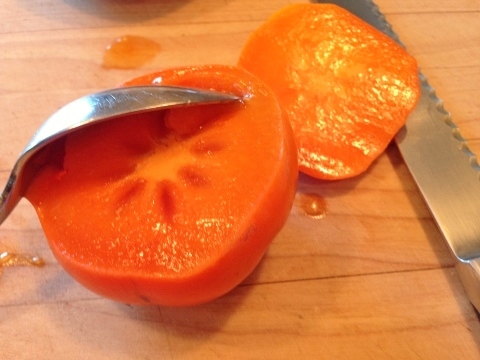 Persimmon flesh is mild in flavor and adds a natural sweetness to baked goods, especially cake. As a kid, persimmons were one of those fruits that usually a neighbor grew and handed off to my mom so we could use them for baking. This fruit is uniquely creamy with a short season and its flavor is hard to duplicate – it’s always reminiscent of the holidays in sweet treats. 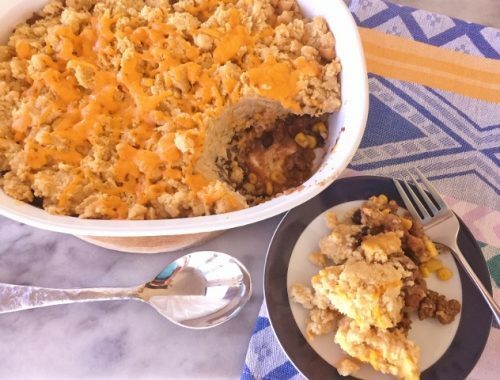 These cakes are great to make during persimmon season, which begins in late fall and continues to the beginning of winter. The first step in this recipe, is to scoop out and puree the fruit flesh and add it to the batter. Then, proceed like you would with a traditional quick bread recipe. These cakes are perfect to serve as dessert after dinner or in the late afternoon with a cup of tea, or coffee. Also, they are perfect for holiday dessert buffets and they make great gifts. 1. Preheat oven to 350 degrees. Cut tops off of 3 large persimmons and scoop out pulp. Place pulp in a food processor or blender and puree until smooth. 2. Add sugars and butter to a stand mixer and mix on high for 3 minutes. Add oil to mixture and continue to mix for 2 minutes. 3. Add eggs and vanilla and continue to mix for 3 minutes until smooth. Add dry ingredients – flours, salt, nutmeg, cinnamon, baking soda and salt and mix on low until combined, about 1 minute. 4. Pour in buttermilk slowly, while mixer is running and mix until liquid is incorporated, about 1 minute. 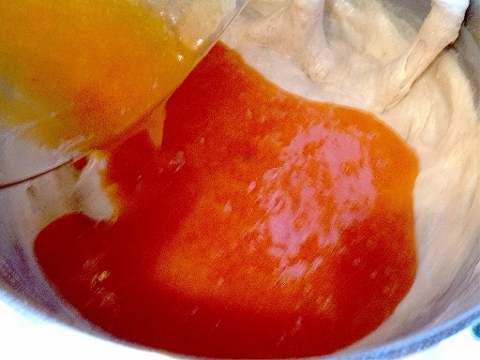 Add persimmon pulp and mix until smooth, about 2 minutes. Do not over mix. 5. 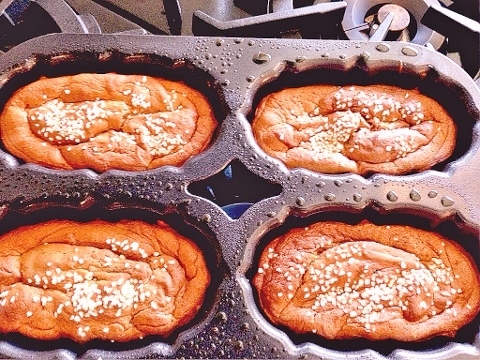 Spoon batter into greased loaf or muffin pans. Sprinkle tops of cakes with coarse or regular sugar, if desired. Place pan in oven to bake for 40-50 minutes for teacakes and 18 minutes for muffins. 6. Let cakes cool for 5 minutes, then turn cakes out onto a wire rack to cool to room temperature. 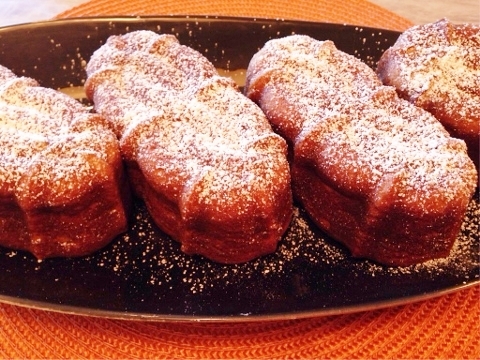 Lightly dust cakes with powdered sugar. 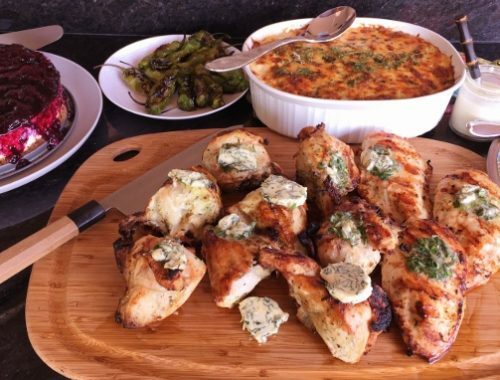 Serve or wrap in plastic and save for later. Enjoy! 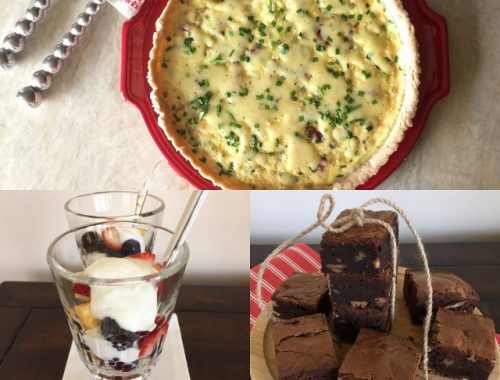 Social Sundays – Bacon & Leek Quiche Tart, Limoncello Fruit & Yogurt Parfaits, and Pecan Praline Brownies!